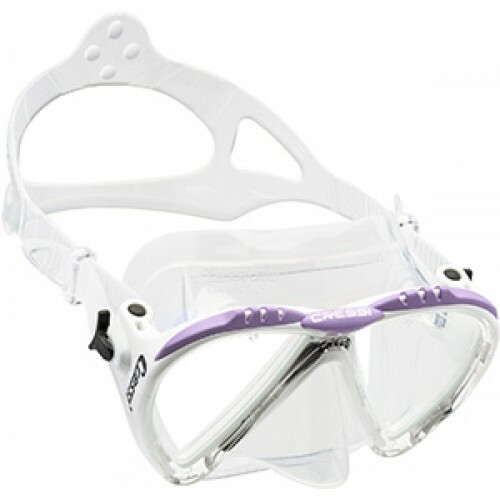 Cressi Lince Mask SKU: CSBMLBL MFR: DS311020 SKU CRS-DS3110XX EAN retail barcodes: 8022983025261 Item model number: ADS311010The Lince Mask is a Tempered Glass Two Lens Low Volume Mask. The Lince has Wide Field of View, with a Double Feathered Edge 100% Hypoallergenic Soft Silicone Skirt that has been designed for Smaller Faces, Women and Children. It's Extraordinary Inverted Tear Drop Lens Visibility, together with Extreme Comfort and Efficient Adjusting Low Profile Buckle System for the Wide Split Style Silicone Strap makes this model a great choice for all diving activities, from Snorkeling to Deep Free Diving, to Scuba Diving. The Lince Mask has an Easy-to-Reach One-Hand Nose Pocket for Ear Equalization which can be utilized even when wearing thick gloves. To protect your Mask when not in use the Lince comes with a Hard Plastic Protective Mask Box. The Lince is available in 5 color choices of Clear/Blue, Clear/Yellow, Light Blue, Pink or Silver/Orange and is covered by a 12 month limited The Cressi Lince Mask is commonly used for Open Water Diving and more. The Cressi Lince Mask is most used by customers who consider themselves to be a Advanced Diver among others. The Cressi Lince Mask is popular because customers like the following qualities of the Cressi Lince Mask : Lens Quality, Range of Vision, Snug Fit. A trimmed down version of the Matrix, the Lince is a perfect fit for many younger divers or those with narrower faces. The extremely low internal volume makes it comfortable to wear and effortless to clear. Divers and snorkelers alike will appreciate the exceptional field of view offered in this ultra compact mask. The Lince incorporates all the design features of the Matrix, but is done in a low volume version. The internal volume of the mask is exceptionally low, lower than many well-known scuba-diving masks and the weight is also very moderate. Two pressure buckles integrated into the frame make strap adjustment quick and precise. This new design strap has a very broad purchase on the neck for magnificent comfort. Excellent mask for snorkelling, scuba diving and skin diving.Technical features: Designed for Smaller Faces, Women and Children 100% Hypoallergenic Liquid Silicone Skirt Lightweight and Compact Design Double Feathered Edged Skirt for Comfort & Fit Wide Field of View Tempered Glass Lenses Efficient Adjusting Low Profile Buckle System Patented Angled Lenses with Inverted Tear Drop Shape Wide Silicone Split Mask Strap Easy-to-Reach One-Hand Nose Pocket for Ear Equalization 5 Color Choices: Clear/Blue, Clear/Yellow, Light Blue, Pink or Silver/Orange Protective Hard Mask Box for Storage 1 Year Limited Warranty Type: two lens mask Versions: clear silicone, black silicone Materials: liquid silicone, hi-tech polymers, elastomers Strap buckles: pressure, with instant adjustment Internal volume: very low. [-] Boxed-product dimensions: 10cm x 12cm x 20cm Product weight: 0.30 Kg.